I really hope that if you grew up in the 90’s, the title of this entry brings a smile to your face. The T.V. show, “Doug,” was a childhood favorite of mine. “The Beets” were a HUGE deal for the characters on the show, with British cartoon rockers singing about vegetables, and of course, tofu. Tofu is one of those foods I don’t eat all that often, but when it is crispy and golden brown, I enjoy it with almost anything. After many attempts at pan-frying tofu and trying to obtain just the right consistency, I wondered if baking might be a better option. Yes, ladies and gentlemen: Your oven is the key to firm, crunchy tofu, and it doesn’t require much work (unless you check on your food’s doneness way before you it is ready because you’re so excited to just eat it already). I will admit, I do this quite often. Tofu is great in stir fries, pastas, salads, wraps, tacos, etc.! You can marinate your tofu in just about anything ahead of time or season it right before you bake. 2. Remove tofu from packaging. Squeeze any excess moisture by pressing down on tofu with a paper towel. 3. 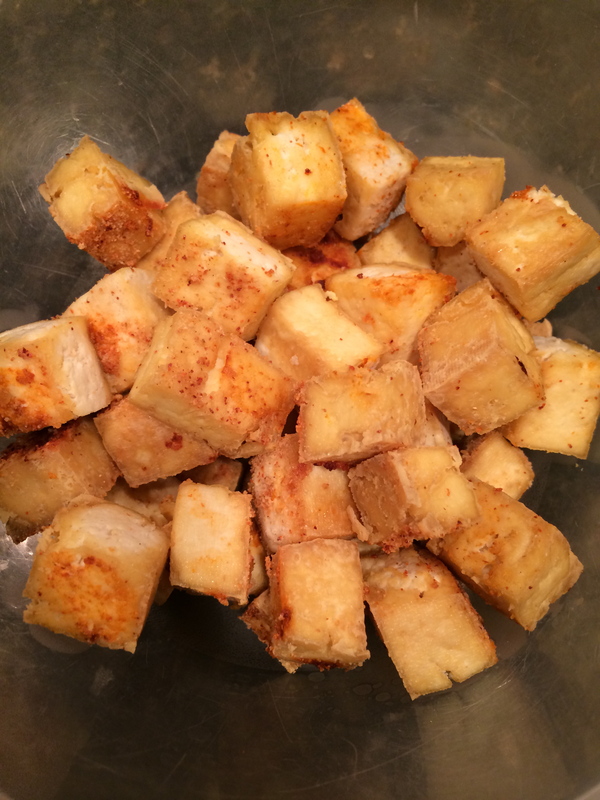 Slice the tofu into cubes or strips. Coat with garlic powder, salt, and pepper to taste. 4. Spray a baking sheet with cooking spray. Add seasoned tofu. Once the pieces are lined on the baking sheet, evenly spaced and not touching each other, coat the top of each piece with a dollop of Sriracha (a little bit goes a long way with this stuff). 5. Bake in the oven until the outsides are golden brown and puffy, for about 45 minutes. Toss the tofu about every 15 minutes to ensure that they are cooked evenly. Serve with any recipe that you choose, or eat them alone for a satisfying, protein-packed snack! The tofu will keep for about a week in the fridge. *Coneys and Kale will be in the great city of CHICAGO for the weekend! Follow me on Instagram for some food action that you won’t want to miss.